Concrete receptacles combine functionality and practicality with longevity. 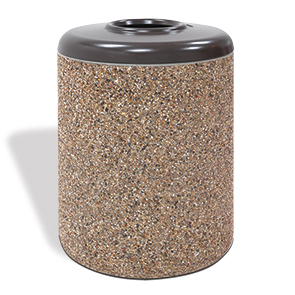 Create clean and inviting outdoor settings with this sturdy 36 gallon round concrete receptacle. The aluminum pitch-in top features a generous disposal opening that effectively encourages responsible litter management. Making a precision connection to the base, the lid conceals contents and odors. Rigid poly liner and security cable are included. A top choice for many high volume traffic locations for its concrete construction. ASTM compliant rebar reinforced precast concrete available in standard and premium finishes.